Merrill Markoe.com » Blog Archive » The Jpegs RollingStone didn’t want. So there is a piece in the new RollingStone about year one of the Letterman show. (If you use the link, check under the area labeled ‘features’ And if the link says something about how you need to be a subscriber, just google Rollingstone,Current issue. And it will appear. Then look for features.). As a lot of you may know, this is not a piece of my past that I revisit much. I have a lot of reasons, among them the fact that whatever the opposite of nostalgic is, I am that. But when the writer of the piece, David Browne, contacted me, I decided I’d play along. Because…you know… why not? And in the course of playing along, the art director asked me if I had any photos. As it turned out, I did. I made jpegs out of a bunch of them but for whatever reason, they never made it in to the magazine. Which brings us to this blog post. Since I went to the trouble of making the damn jpegs , I thought maybe fans of the early Letterman show might enjoy seeing them. Lets get ME over with first. Here I am when the show first launched. The important writer shirt was a sarcastic souvenir from my days of being a struggling writer at large, newly moved to Hollywood. Which, at that point, was just a few weeks before this. I thought it was a very funny thing to have on a shirt that labeled me an important writer. In fact, it was the funniest thing I could think of. That, in a nutshell, was me then. I’m going in chronological order…This is a picture of the set during a rehearsal of The David Letterman Show, which was Dave’s live MORNING show. It preceded the night show. It was on the air live 90 minutes a day at 10 in the morning on NBC for 19 weeks before it got cancelled.It was a lot like the night show but, if you can imagine it, even weirder. It had “a family”…many of them funny cerebral comedian character writer/performers. (The brilliant hilarious Valri Bromfield, Edie McClurg, Wil Shriner and Rich Hall, to name 4). The guy sitting with Dave is comedian Bob Sarlotte, who was supposed to be a kind of a side kick. He moved his family all the way to NYC, only to have the whole show up-end in just a few months. This was not the way things were supposed to go. However, when the show was cancelled two good things happened. We won an Emmy. 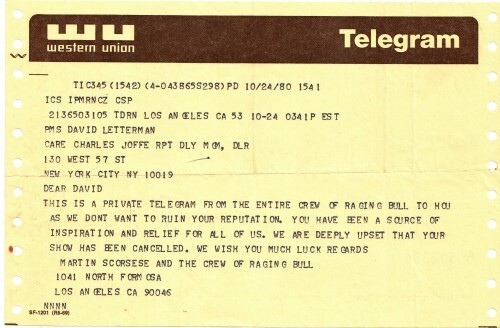 And we got this cool telegram from Martin Scorcese. Now on to “Late Night with David Letterman” on NBC. This was the next version of the show. 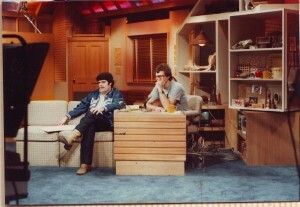 Here is what the host and one of his guests looked like during year one of that first late night show. 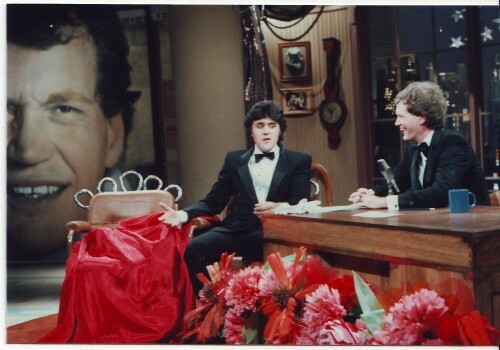 By the way, in case it is not obvious to you…that guest is Mr. Leno. 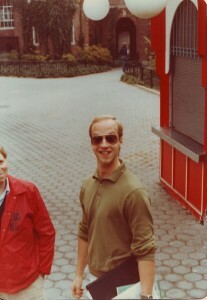 And this is what my assistant Chris Elliot , who was about 13 at the time, looked like. I had to get his mother’s permission to take this picture. No No. I am kidding. But he was about 19. 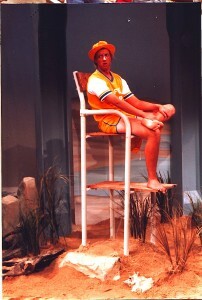 The photo beneathe this one is what he looked like playing a LifeGuard in a ‘fun in the summer’ special. Now for some writers. This is a scrapbook page I didn’t want to dissemble. 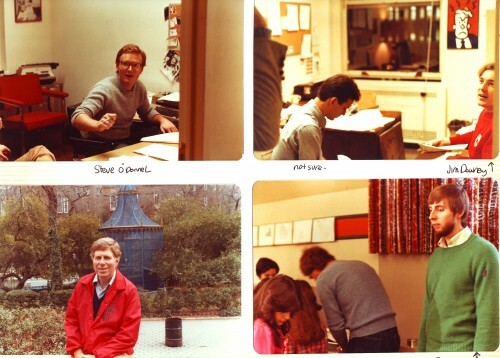 Starting top left, the young Steve O’Donnel,(who went on to headwrite the show for many years) then Jim Downey talking to “not sure”…who MIGHT be Sandy Frank. (but still not sure.) They are in Tom Gammill’s office, as you can see by the signature Gammill painting on the wall. Tom has a cartoon strip called The Doozies. (Google it, sit back, pour yourself a beverage and make an evening of them.) Below on the right is my dear pal George Meyer,(more recently of The Simpsons). In this photo he is pretty much right out of college. He is on the site of a science fair that we covered for the show. Unless he was one of the exhibitors. And below on the left is the always funny and fantastic Hal Gurnee, who was our director. 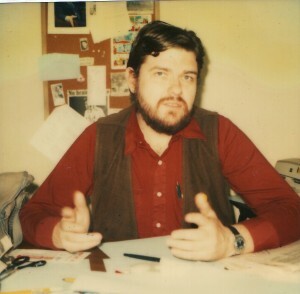 Here is the young Tom Gammill on the cover of an in-house news letter he and his partner Max Pross were writing and distributing to the staff. Next is my old friend Gerry Mulligan, who stayed at the show until a couple of years ago when he retired! But this photo is taken of him when the show first started. And ladies and gentlemen, the hilarious Andy Breckman, who later in life became the creator of MONK. 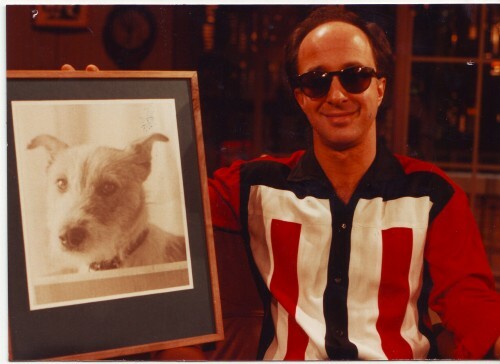 Here is Paul Shaffer holding a photograph of Hal Gurnee’s dog Burt. For reasons of his own, Mr. Gurnee was obsessively photographing everyone who came on to the show holding this picture. Somewhere there are HUNDREDS of these. Not sure why I have this one. And here I am in a segment for the first anniversary show called Stupid Writer’s Tricks. I am doing a scene from a theoretical sit-com I wrote for myself called My Little Merrill. In the scene, my husband has told me that the boss is coming for dinner. But oops. Darn. In my hurry to get everything perfect I dropped a 100 lb. weight on the dining room table and broke it in half. This certainly proves I haven’t changed as much as I thought. Which brings us to Dave and the Grateful Dead. And with that we conclude this portion of the jpeg assortment. But wait…wait…one more thing. A word from our sponsor. We hope you enjoyed this pointless trip down memory lane. We (and by we I mean ..uh…you know…) are so hopeful that we (I) would like to take this opportunity to (coughing fit. Excuse me.I’m sorry. I can’t stop coughing. Oh. Where was I again? Ah yes.) Ahem. I have a new book coming out November first. It’s a book of funny personal essays. 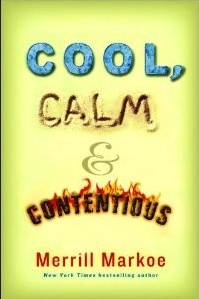 Its called Cool Calm and Contentious and if there is any chance you can be talked in to pre-ordering one, you can do it HERE (amazon) or HERE (Barnes and Noble.) Thank you. Now back to our regularly scheduled programming. Not that there is any. This entry was posted	on Friday, September 16th, 2011 at 9:49 pm	and is filed under blog post. You can follow any responses to this entry through the RSS 2.0 feed. You can skip to the end and leave a response. Pinging is currently not allowed. Hey, thanks for this! I vaguely remember LOVING that morning show when I was a 19 year old living in Denver. But when I mentioned to someone a few years ago that Letterman used to have a morning show, they told me I was wrong and reminded me that drugs and alcohol were part of my life back then, and perhaps I’d had mushroom for dinner? And they probably weren’t sautéed mushrooms. And I just never googled it. I gave up the drugs, but now I need to finish my drink and go to bed. Hard to believe a morning show like that ever existed. But I have very fond memories of watching it while I was also learning how to deal with my first hangovers. That was quite a collection of young writers, but television like that could only be done by the young and, to some extent, fearless. I am looking forward to getting my hands on your book. You know, it wasn’t really so much about being young and fearless as it was about being able to work under the radar. At the time I used to think to myself “No way I could ever get any of this material on to some other show. Just the pitch would be frowned at ,then killed by unhappy executives.” But we were on so late at night and the budget for the show was so low,.no one was paying very close attention. The biggest obstacle was getting an idea past Dave. And Dave’s approval/disapproval was always based on whether it would get a laugh, and not much else. So…that was a very unusual situation for a show that was on the air. I have heard Lorne Michaels talk about something like that in interviews. At least, in the early days of SNL., the feeling was as if they had snuck into the studio after everyone else had gone home and put on a show. Or maybe that was what they wanted the audience to think. Thanks for those photos. It was nice to see Abby Elliot’s dad in his younger days. Ahhhhhh the morning show. Thanks for the memory! Loved it!!!! A real treat to have you revisit a past that had such a lasting impact on so many of our lives. Either Steve O’Donnell or Stephen Winer once told me that after you stepped down as Head Writer, and before Jim Downey came aboard, Andy Breckman took on that role for an entire week. One other tidbit I noticed some years ago: That Stupid Writers’ Tricks occurred at the end of Week 18 at Late Night. Since the very last morning show — which occurred at the end of that show’s 18th week — featured that same Stupid Writers’ Tricks segment (and you reprising that very same sight gag), I always wondered whether the Late Night segment was an homage of sorts to the morning show, having reached the point at which the morning show had ended, and that you were all now in uncharted territory. Geez…who knows. I think we were just trying to put together as good a show as we could. We always used anything from the morning show that seemed appropriate. Because…you know…WHY NOT? Well, either that or the timing was an uncanny coincidence. Thanks again for sharing your memories. 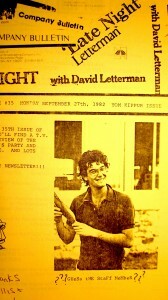 Reflecting on this a little further: That End-of-Week-18 LN show was the 90-minute “Dave” special, and, in addition to reprising the morning show’s Stupid Writers’ Tricks segment, Harve Mann was on throughout, singing new lyrics to the LN Theme as well as intros for guests Jay Leno and Teri Garr and Stupid Writers’ Tricks. He closed the show with his special rendition of the “Love Boat” theme. So she was certainly aware of the significance of that week number at LN. I can’t help wondering if others on the staff were as well and thus helped formulate ideas for the “Dave” special with the morning show’s final 60 minutes in mind. 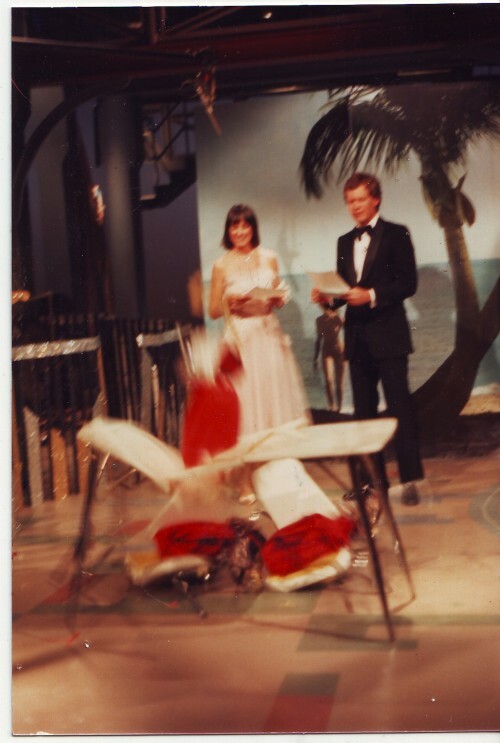 We were intentionally re-cycling everything that worked on the morning show, correctly presuming that not many people had seen it the first time. If that’s what you meant, then yes. That’s what we were doing. If you are attributing some special significance to the number 18 in terms of weeks,and wondering if it was an intentional homage… then no. That was a coincidence. Understood! Thanks for indulging me on this arcane detail, Merrill. Appreciated. 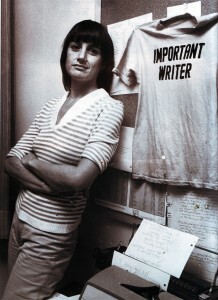 Merrill, that “important writer” photo of you establishes you as the Chrissie Hynde of comedy. I’ve been a fan of your work since Late Night, and “Late Night with David Letterman: The Book,” has survived five moves since I bought it decades ago. Thanks for sharing these pictures with us! Wow. I LOVE that. I used to hang out with her a little bit in the nineties. Haven’t seen her in a long time. But she’s definitely WAY cooler. But THANKS! That may be the nicest thing anyone ever said to me!! Would that make Dave the Ray Davies of comedy? Anyway, thanks for sharing the memories…and what a team! It’s odd to me to know that Dave only let something on the air if he thought it would get a laugh, because so many things on the show did not get a laugh. If you’d had your druthers, what other criteria would have been employed? When you’re trying to get a laugh with untested material that you also hope is smart and original, the best you can do is put the best bullets you can find into the gun and fire. That said, I guess the criteria I always like for comedy is the combination of silly/cerebral. The front…if you wondering if I was setting myself up for a shot thru the heart or a bullet in the back. And if you go to the “books” section of Ms Markoe’s site, you’ll see one of her pooches (Puppyboy?) doing the same thing. These are SO GREAT. Dave and Jay seriously look like they’re fresh from the prom in that one picture. What a prom that would have been. So sorry we all missed it. Back in the early 80’s, we got our first VCR just to record Latenight every night so we could get some sleep and off to work on time the following day. Living in the Eastern Time Zone back then and having an hour and 1/2 commute was killing us. Personally, I thought it was really cool at the time that Dave had a female writer on his staff. Something unheard of back then and to some extent, still. We taped and saved all the episodes with Jay. Those were keepers and the two of them were a real scream when they got together. I read once in an article that — like you said — every idea has to get past Dave first. Sadly, I think his internal laugh-o-meter has been on the blink for some time now. But he IS a legend and you played a huge role in getting him there with your innate ability to be seriously silly. Today, it’s Kimmel and Fallon for us. And yes, we still use our good old VCR occasionally so we can get some sleep. Thanks for this Merrill. I started watching the show at age 13 (the 3rd anniversary show, I think). And have been a fan ever since. I used to love the pretaped segments, they always made want to pack up and move to New York and beg for a job there. Have you ever considered writing an illustrated history of the show with all of your memorabilia? Oh…and you look purdy in the pictures. If they make a movie, Paget Brewster should play you. The Rolling Stone article mentions that you are a “self described baby comedian”. What’s the story behind this? Are you especially talented at making babies laugh? Or is it that you are just so much more talented and younger than those around you? I think this must refer to how I saw myself when I met Letterman…that being the topic of the article and all. Thanks for the reply, and thanks for your hard work and creativity. I remember the morning show well. I worked nights at the time. Wasn’t there a “news break” every so often with the newscaster in the studio? Do I remember him getting applause and looking embarassed? Doesn’t matter really but that’s what I remember. Yes. That was Edwin Newman. And that segment, which had been mandated by the network, was removed because it couldn’t exist in a sterile atmosphere when the rest of the show was so goofy. You remember correctly. Thanks for the memories. Great to find your site. I will continue to watch it. I also remember the HBO special with Harry Shearer. The point is, if I can remember it, I would love to see it again. Lord knows we have the ability if only the lawyers could agree. Oh goody! Just watched with my husband. Three phrases from Conversation have been in our family lingo for these 20 odd years: It’s something you do well, Food involved and I just thought of something, we could kill her. Yeah, yeah, we’re overly involved with our dogs too. Posting to Facebook. Powered by WordPress v 4.7.13. Page in 0.590 seconds.